Claude Monet is buried at Giverny. His grave is located behind the church. It’s a 10 minute walk from his house. 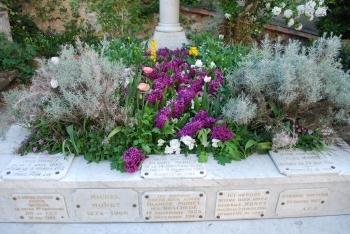 It is a big family tomb planted with flowers, what sounds only natural for such a great gardener. Monet rests together with his second wife Alice, his two sons Jean and Michel and their wives. Susan, a daughter of Alice, and Alice’s first husband Ernest Hoschedé also keep Monet company. It is rather ironical that Monet and his rival rest in the same grave. The reason is that Ernest was the first one to die, and his children -raised by Monet- wanted him to rest in Giverny to be able to go on their father’s grave easily. The next one to pass away was Susan. Logically, she was buried with her father. Alice never recovered from this latter grief. When she succumbed to leucemia, she joined her beloved daughter in her last residence. Next came Jean, Monet’s son, and Claude Monet himself. He died the 5th of December 1926 from lung cancer.